As spring time approaches this season, a bass anglers fancy turns to burning lipless crank baits across fish covered grass flats, and speeding up and down the lake putting bass in the boat with disturbing speed. However many anglers fail to realize that some of the finesse presentations that work during the slower months, also can put good fish in the boat when fish are more active, such the case in the spring. I speak from experience when I say that slowing down this spring, and trying some lighter, more finesse-like presentations can put bass in the boat that other anglers might pass up with their higher speed approaches. For the sake of instruction I will cover some of the presentations and tactics that have paid off for me in the spring, in both tournament, and recreational angling. The first of which is dropshotting. As I said before, dropshotting might not be the first tactic on the minds of anglers come spring, but there are certainly applications for it. A good example of this would be working a drop shot rig off the first and second drop offs when good fish are preparing to move up to their spring spawning spots. One of the more popular approaches to a situation like this might be a crank bait or perhaps a fast moving spinnerbait, but when one realizes just what a drop shot rig does, you realize its almost custom tailored to this particular situation. By fishing the drop shot, on these ledges and shelves adjacent to spawning beds, you do what a crank bait does, only better. When fishing cranks or spinnerbaits, the lure which is based on movement, is only down in the strike zone for a minute or two depending on the speed in which the angler works the bait. However with a rig such as the drop shot, you have the ability to specifically target hot spots on those drops offs and shelves, and you have the ability to leave the bait in the strike zone indefinitely, which is the advantage of a drop shot in the first place. This, a tactic that is normally associated with deeper water, can be used in nearly any water depth. Long Island fluke and flounder anglers who have been using a similar rig for years, will tell you that no matter the water depth, the idea of suspending the bait above the sinker, will most certainly be effective. 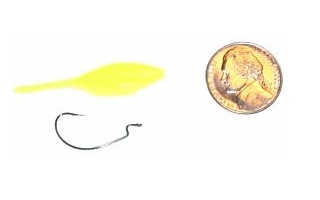 Now one of my favorite drop shot rigs, consists of a bacudan sinker, which those familiar with drop shot sinkers, realize has a pull away knot design, so should you snag the sinker, the rest of the rig will pull away, giving you the ability to save time by simply attaching another sinker, rather than retying the entire rig. I personally prefer a 1/16th to 1/8th ounce sinker, depending on the depth I am targeting, and depending on surface condition such as wind. 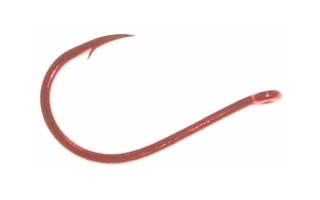 As for the bait, my weapon of choice is the 2 and 2 1/2 inch Robo Worm drop shot baits, complete with internal rattle, rigged on the new Daiichi D25Z drop shot hook, with Bleeding Bait red finish, in either a size #4, or #6, which obviously I math to the size of the bait I will be using. One of the advantage of ahook specifically designed for Dropshotting, such as this Daiichiis is that it consistently gets more solid hook-ups when fishing your drop shot rig. you can see in the inset picture, of using the Daiichi drop shot hooks, is that the gap allows either nose hooking a bait, or rigging it conventionally on the hook. Also, the added flash and flare of a red tinted bait, which is one of my favorite spring time colors, in conjunction with the red flash of the hook seems to really put bass in that mood that we love so much, which I call seek and devour. By targeting bass with the drop shot come spring time with a drop shot rig such as the one I mentioned above, I can just about guarantee that you will be cashing in on many of the fish that angler using a speedier presentation will most certainly pass by. One final hint I might add, getting a hold of a good contour map to locate likely spawning areas, which are adjacent to the shelf style contours that I mentioned above is critical. Also a bit of scouting might be in order before the spawn starts to really pin point areas where this type of presentation will be most effective. Another great way of lightening up the tackle to target spring bass, is a modified version of what as of the last two season has been my all time favorite rig. That's the weightless worm. Either a four or six inch worm, preferably one with a smaller profile, has caught more fish for me than I care to attempt to count. I now however realize, that this tactic, with a few minor modifications, can also be a sure fire fish catcher come spring. I devised this rig using a some input from a good friend of mine in Massachusetts, biology major and avid angler Mike Byrne. After a brief lesson in fish behavior, he informed me that not only will fish defend a spawning bed, which we all know, but will also attack potential nest predators during the pre spawn. This got the gears whirring in my head as to how I could cash in on this little idiosyncrasy that bass have. It so turns out that many fish will attempt to rid the area of potential predators, as so when they begin to and actually spawn, the area will be free from nest raiders. A quick side not to non bass anglers, this behavioral attribute applies to nearly every freshwater species, not only bass. We came to the conclusion that the number one bass nest predator, small lizards, and crawfish, will be struck far more often than say a worm presentation, which was the original bait of choice in the weightless rig that I mentioned earlier. So come spring time, my first modification to this rig, is to forgo the aforementioned worm, in lieu of a smaller craw or salamander imitation. Once again, bass anglers know that your average craw is a bottom dwelling creature, as are most small lizards. This made me realize that a mid water column free suspending rig will not get the job done here. I needed something that would stay to the bottom but not sit there like a brick. That's would be when we both had the same idea at the same time. The only way to change the fall rate of a weightless rig, without using sinkers, was to change the hook. When fishing this rig in the spring, I make it a point to use a far heavier hook that I would use when fishing the summertime worm tactic. An example of this would be to go from a X15Z X-Point XGap hook, to the heavier in weight, X25Z hook of the same size. The added weight of the hook brings the bait to the bottom, but also allows the action of the bait to remain unimpeded and give it the free moving finesse look that puts the bass in the well. By changing the weight, rather than the size of your hooks, you can modify the way your baits fall and perform in the water column, while keeping the performance of a smaller hook. I can only beg that you try this rig come spring on your favorite lake, and see for yourself just how effective it really is. I even went so far as to tank test this idea, and saw how subtle the fall, and just how lightly the bait remained in contact with the bottom, which is exactly what the real deal as far a craws and lizards do. As I mentioned earlier, getting this bait in and around potential spawning locations will lead to reaction and defensive strikes. As for both presentations, be prepared for fast, however not hard strikes. Being a line watcher here will definitely pay off in your favor. As often times you will not feel, rather than see the strike through the line. Fishing this rig in and around pre spawn fish, in optimally 5 to 8 feet of water will again, as the drop shot will, pick up fish that many of the anglers throwing movement based baits will undoubtedly pass up. Just something to keep in mind when you wonder where all the active fish went on your favorite spot. One thing I did not cover in the two paragraphs earlier is line weight. I would go no heavier than eight pound test both with the drop shot rig, and with the modified craw rig. Keeping down the line signature will also pick up fish that are leery of plastic imitations, and will also keep the action of the baits natural. I personally use six pound test Izorlineas the line signature is kept to a minimum due to the smaller line diameter. That being said, keep in mind these light presentations this spring time, and also don't be afraid to try your favorite light tackle presentation, changing only the location where you are employing it. Then you can watch the jaws drop at the scales or at the ramp, when anglers ask where you caught your fish, and you tell them it was in the same spot they were fishing! You just, as Emril says...kicked it down a notch.